Another thing I found at the Mueller prairie restoration on August 28th was this small but colorful damselfly. I wasn’t exactly sedulous in my attempts to identify it, though it looks as if it could* be Argia sedula, known as the blue-ringed dancer. But in the end I let it go—the identification, that is; the damselfly was always free. * Have you noticed the recent proliferation of the phrase could possibly? The word could already means ‘has the possibility to,’ so could possibly is redundant; it stretches the compact Anglo-Saxon could from one syllable to four, three of them unnecessary. This is outstanding, Steve. i can’t get them to sit still for 1/125th of a second. Thanks, Ken. For me it’s off again, on again, with respect to damselflies and dragonflies. Many fly away but some come back, often more than once, to the same perch or a similar one, so if I’m patient I manage to get a few close pictures from time to time. It is. There are other species in which the “joints” are black and the segments between are azure. Steve, clarity and details draw me into the delicacy and design of this joyful creature. Oh, and thanks for the link for sedulous. It occurred to me that your phrase “clarity and details” would also work as a description of what a good teacher provides. One thing that I’m sedulous about is etymology. I’d assumed—like the author of a certain highly regarded guide to English usage—that sedulous came from the same root as assiduous, but when I looked it up last year I was surprised to find that it didn’t. The species name sedula led to my playing around here with sedulous. Interesting leap into the education arena–certainly memorable teachers do provide clarity and details. Mostly, I hope that they inspire. Having taught mathematics on and off throughout my adult life, I came to value clear explanations of the details in my subject. Sometimes I miss being back in that role. I also wish our poor country had more teachers, especially in elementary school, who knew arithmetic, could impart it to children, and would hold them accountable for learning it. Many observations motivate my wish, but here’s one from last weekend. In an upscale supermarket a young woman was giving out samples of nutrition bars that she said were on sale at 2 for $3. I asked if I could buy just one, and the woman said yes, but she was unable to figure out what half of $3 is. Once I was in Colorado, attempting to make a purchase. The cash register was out of order and the young clerk couldn’t figure out how much the sales tax would be. I asked what the rate was and she replied “ten percent”. Ouch. So much for Colorado mathematics programs. Ouch indeed: that warrants at least an “oy vey” squared. It’s pitiful, especially when you consider that the people involved in these incidents have usually been given (I didn’t say earned) a high school diploma or even a college degree. That creature ‘could possibly’ be one of my favorites. Maybe. Your link to argia sedula could be broken. I looked at BugGuide. They agree with you. Thanks for pointing out the non-working link. In fact it was supposed to be the very one you provided (and which I’ve fixed in the post’s text). Great photo but I daresay I loved your little grammar rant more! Hahahahaha. I’m an imcredible stickler when it comes to incorrect word usage and grammar mistakes!! I guess I haven’t noticed “could possibly” because I’ve been fixated on the incorrect use of the I/me pronoun. I swear I’m the last living English speaker who knows these words are NOT interchangeable! !! Arghhhhh!! Oh my, yes! “At this point in time” is a great example of an unnecessary phrase if ever there was one! And French has the similarly bad aujourd’hui, which if you take it apart etymologically means ‘on the day of this day,’ i.e. ‘today.’ That’s become standard French, but I hope the same will never be said about at this point in time. That’s what’s known as a fixed phrase or set phrase, and every language I’m aware of has its share of them. We can call it the pleasure or treasure of azure. Could it possibly be a later addition to denote an extra degree of doubt? Merci, Alain. Je connaissais le mot demoiselle mais pas agrion, que mon Petit Robert explique est d’origine grecque. Ha! You know that I’m a serious practitioner of the ‘if you can say it in two words, it’s more fun to say it in twenty-two’ art, so I could not only possibly but indeed very likely, if not probably, be one of the worst offenders. The damselfly, however, is innocent. Just wondering: if damselflies and ladybugs are able to be unperturbed by supposedly sexist names, why are we humans so hung up on them? I find it interesting that my asterisked note about language generated more comments than did the ostensible subject of the post, the damselfly. And speaking of language and the little damselfly, you raise a good question. I think it’s another case of pendulum-swing. Women were kept out of many jobs and roles for a long time, so once the tide began to turn, the most ardent supporters of the change rose in a fury against every little vestige or hint of past inequity. You may recall that in the 1970s some people even wanted to rename the round metal utility cap in the middle of the street a personhole cover. Some of that stuff is just plain silliness, but some is dangerous, as when many (probably most) college campuses today restrict free speech and take the stance that everyone has a right to be free of a “hostile” environment. But do we really want a behavioral climate controlled by the most hypersensitive among us? As I’ve said on other occasions: An orthodoxy is no less an orthodoxy for being new. Anyhow, that’s why I stick almost wholly to nature and photography in this blog. Une vraie merveille Steve et comme d’habitude quel piqué! un régal pour les yeux. J’aime beaucoup ces petites demoiselles. Mieux un piqué qu’une piqure, n’est-ce pas? Moi aussi j’aime beaucoup ces petites demoiselles, mais je ne réussis pas toujours à les photographier. Those wings are like tiny wires. Such clarity! I’ve seen my share of damselflies, but sedulous is a new word, and a nice one. I do like the way the name “Blue-ringed dancer” describes both the insect’s appearance and its behavior, but I mostly enjoy the chance to sit and admire its details. The “blue-ringed” is accurate, but I’ve wondered whether this group of damselflies really dances around more than any other group. I haven’t been sedulous enough to verify that. A stunning photograph, Steve. 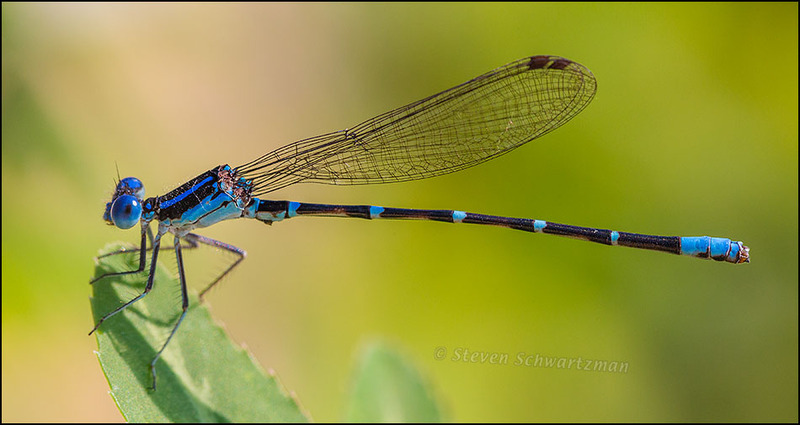 The blue of the damselfly is gorgeous. I might possibly share this on my networks. The blue reminds me of your current seacoast photo. You can share this azure treasure if you’d like to spread the pleasure. Sedulous, of course, now, that’s the word I should have used in responding on the green heron post, or actually, not sedulous! I am always stunned at the color on dragonflies, etc. (not sedulous again), and you’ve sure done a great job of capturing that here. Thanks, Susan. I wish I were as sedulous about modern classical music as you.